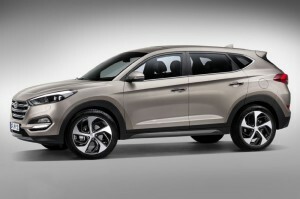 Hyundai has officially revealed the first official image of its 2016 Tucson which is all set to make its debut at the Geneva Motor Show. The Crossover gets many of its design features from its elder sibling Santa Fe sporting a much more slicker overall design. The new compact crossover adopts Hyundai’s Fluidic Sculpture styling language, with clean flowing lines and fluidic proportions than its outgoing predecessor. It gets the Chrome hexagonal front grille sporting sleeker headlamps equipped with daytime running lights. In addition, there are prominent character lines running along the sides that further adds to the overall aggressive look of the crossover. Meanwhile, the rear tail lamps are reminiscent of those found the i20 hatch, while the black trim around the alloys lends it a more rugged look. Hyundai claims that the 2016 Tuscon is built on an entirely new platform, with more spacious interiors despite the same exterior layout. The interiors have been spruced up and appear much more enhanced with a clean dashboard layout, much like Sonata’s interior. Other interior upgrades include ventilated front seats, active safety features and a power tailgate. Coming to its engines, we have a 2.0 litre diesel along with a 1.6 litre petrol, both of which are tuned for performance and mileage. Also included are a plethora of safety and assistance systems which include Smart Parking Assist, Autonomous Emergency Braking, Lane Keeping Assist System, Red Traffic Cross Alert, Blind Spot Detection, Speed Limit Information Function and Active Bonnet System which automatically raises the hood to cushion impact shock in an event of frontal collision. 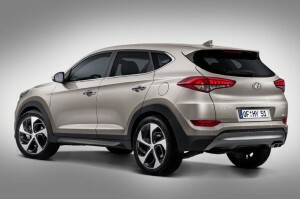 The 2016 Hyundai Tucson debuts in Geneva next month, stay tuned for more.